HOBSON, Richmond Pearson (1870-1937) was a United States Navy rear admiral who served from 1907–1915 as a U.S. Representative from Alabama. A veteran of the Spanish–American War, he received the Medal of Honor years later for his part in that conflict. 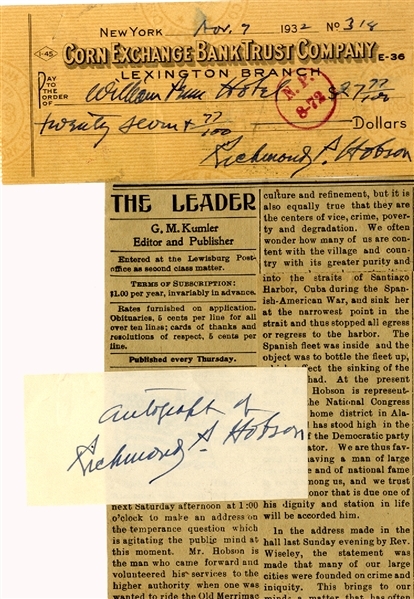 Document Signed, “Richard P. Hobson” on his cancelled check , November 7, 1932, in the amount of $27.77, VG. ,,, plus, Signed Card, “Autograph of Richard P. Hobson”, fine.